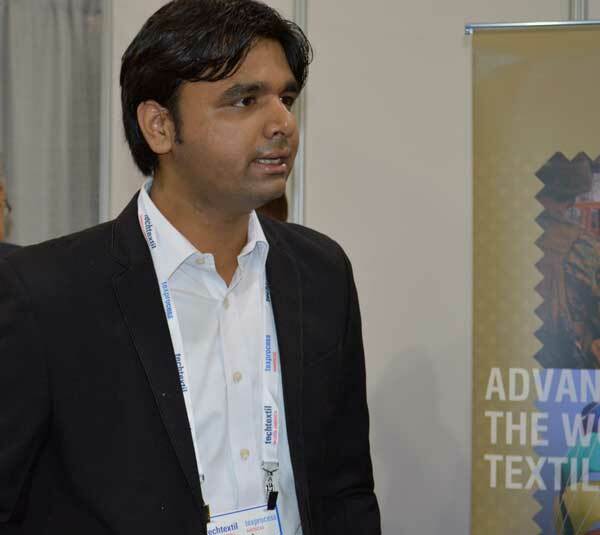 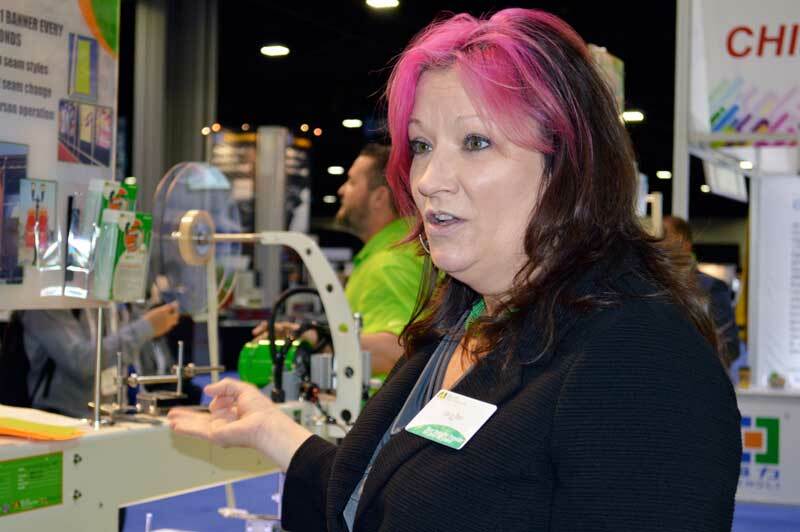 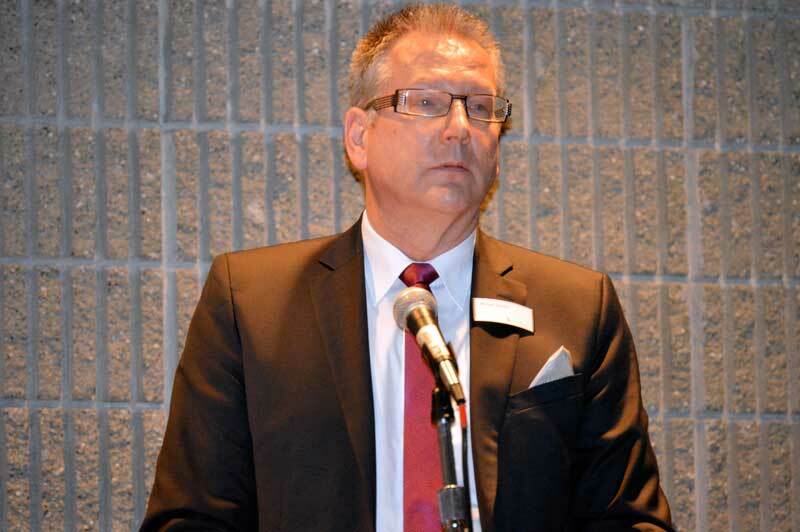 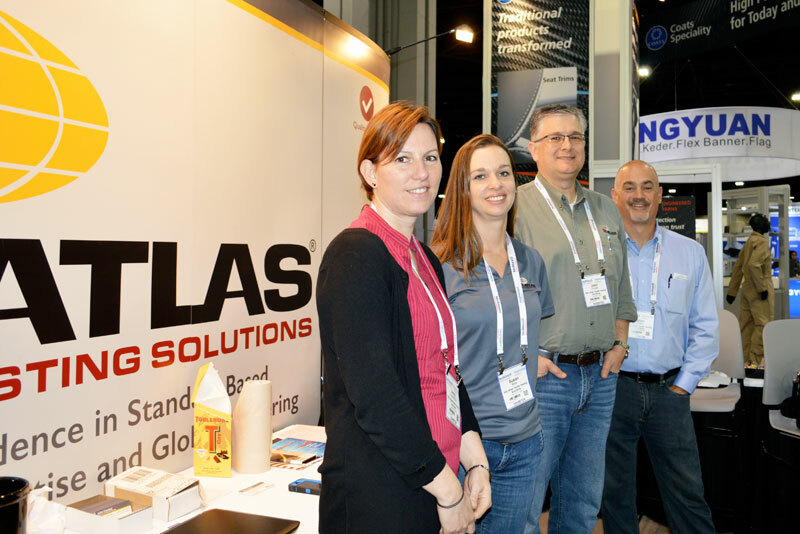 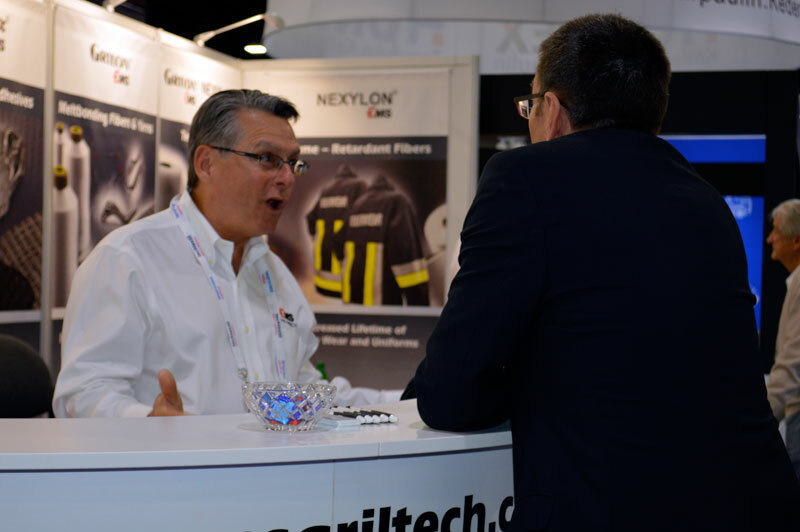 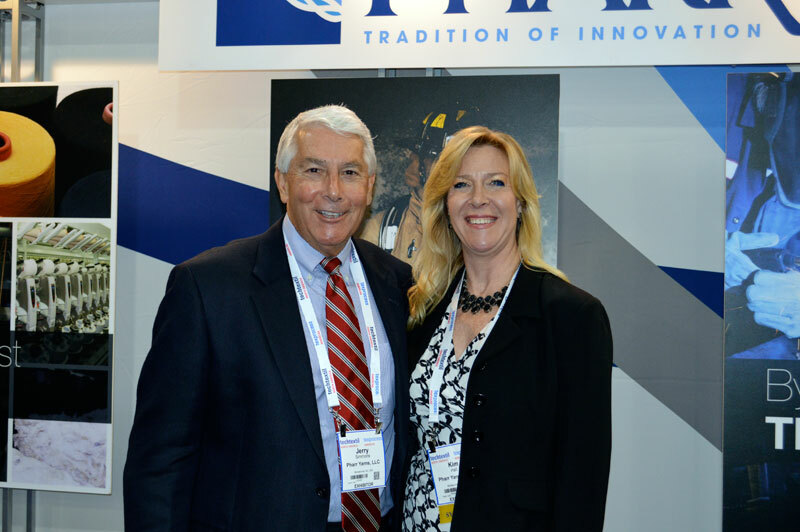 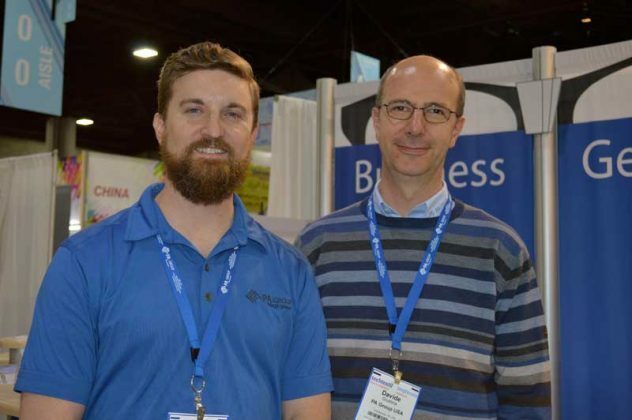 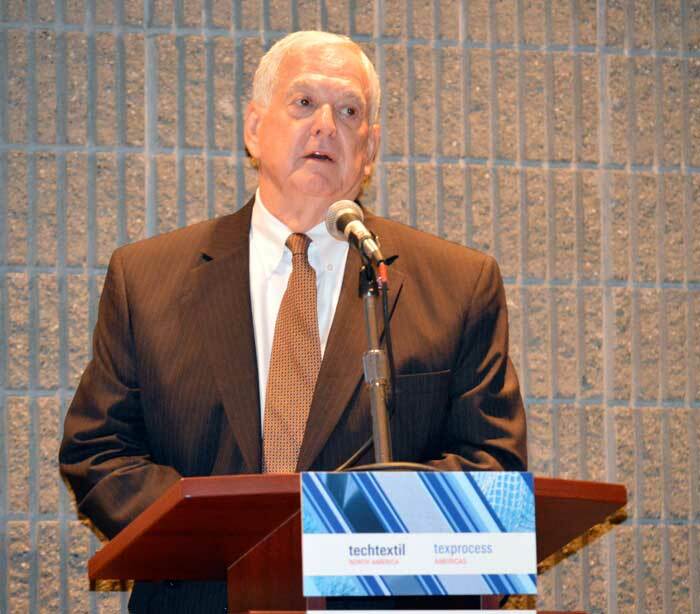 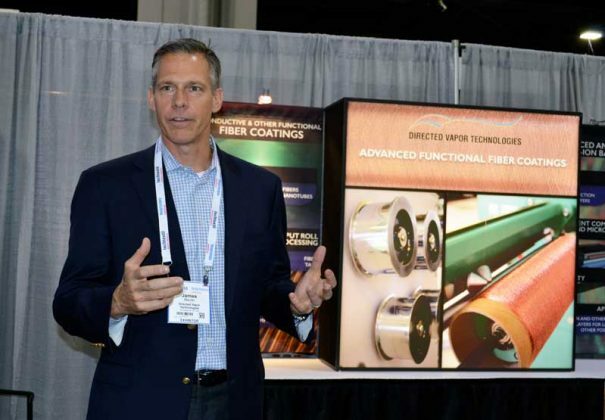 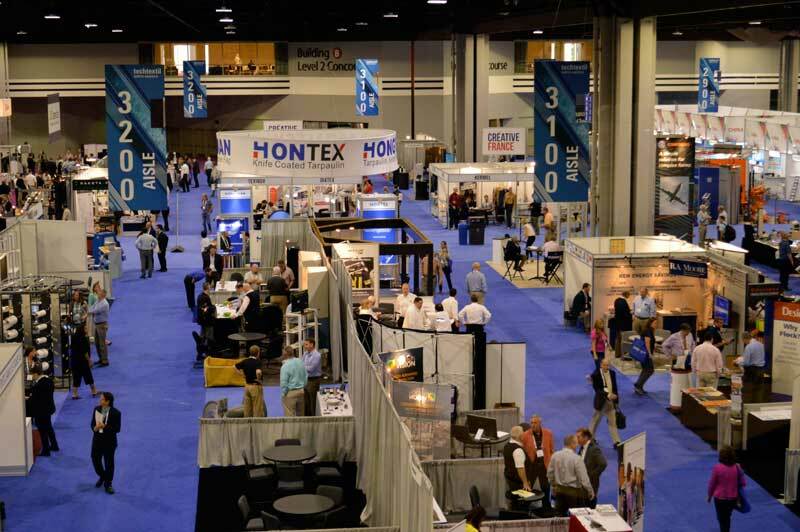 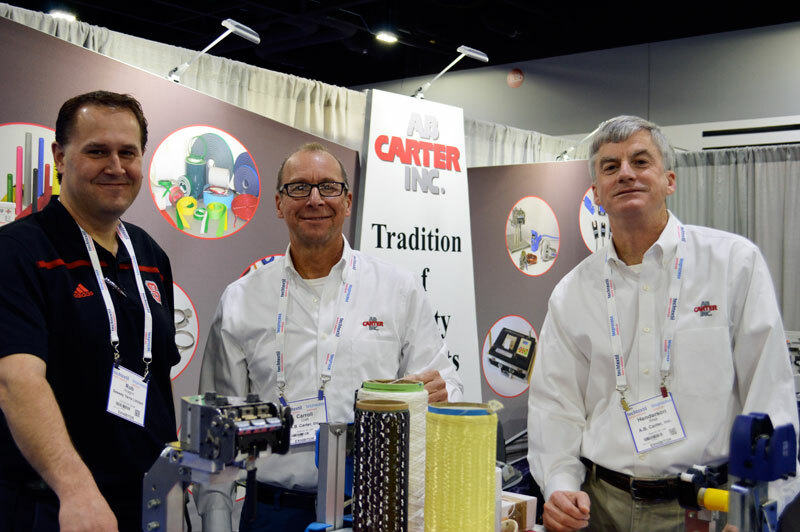 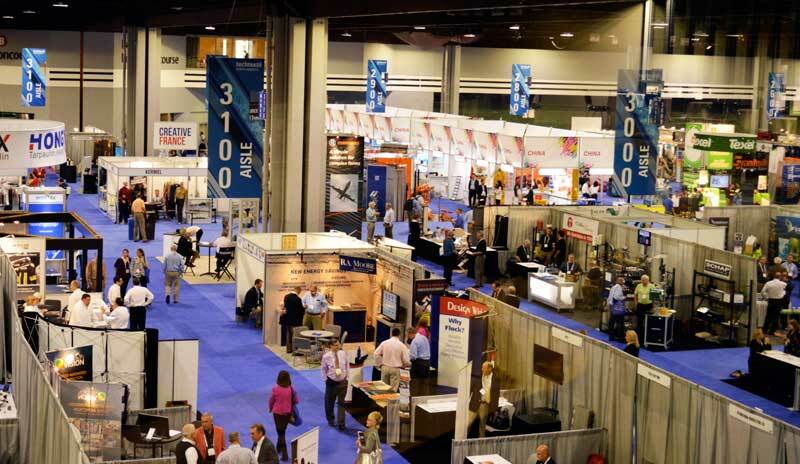 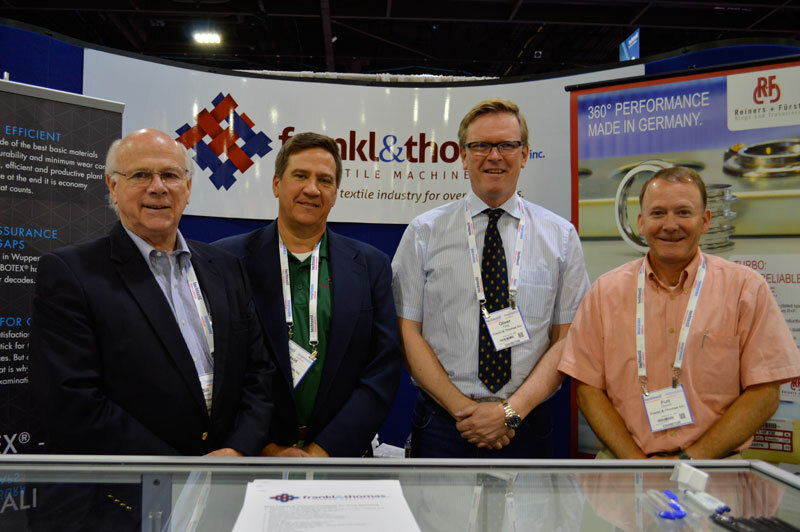 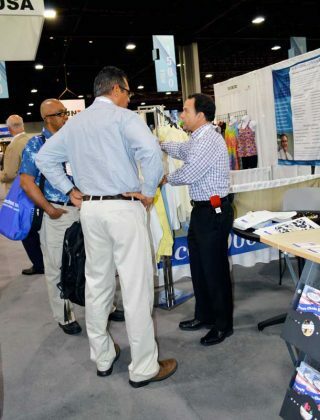 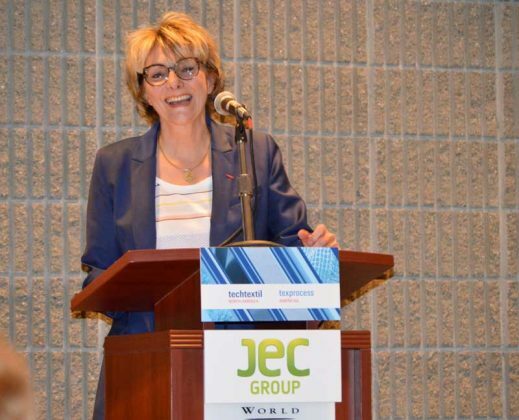 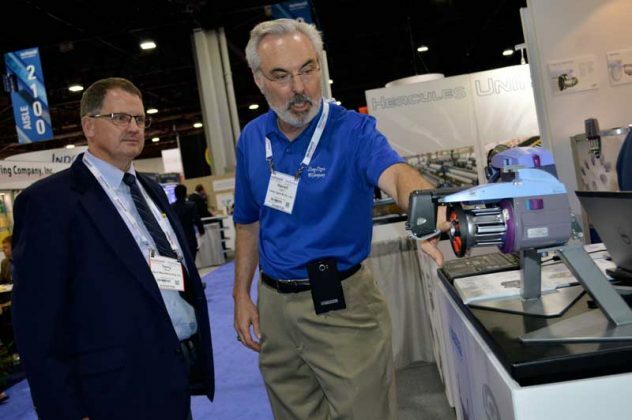 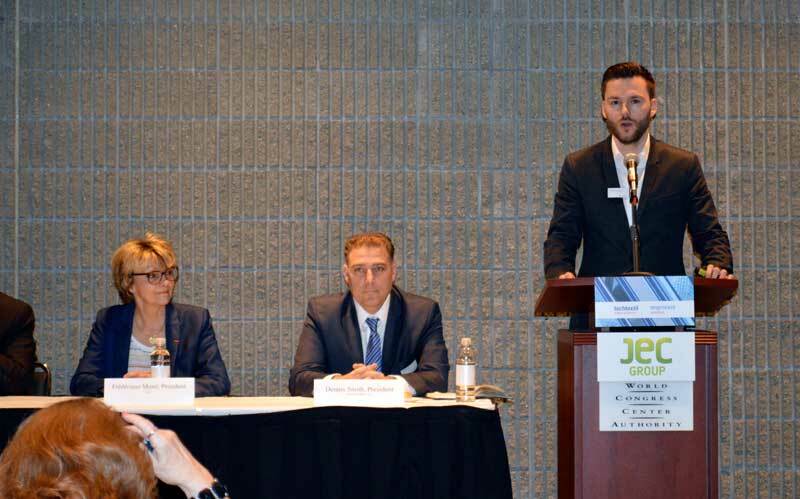 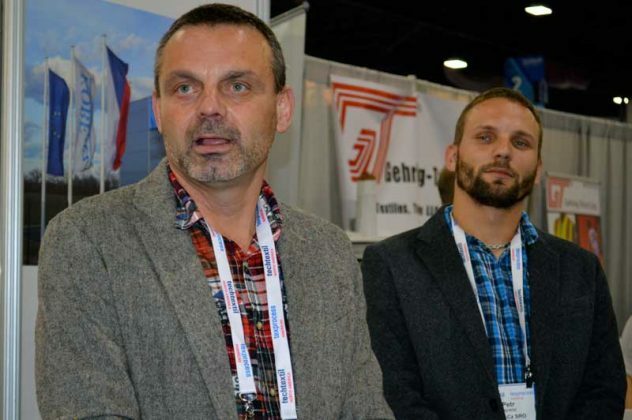 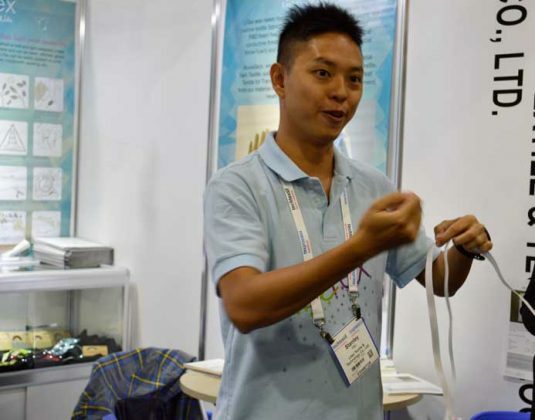 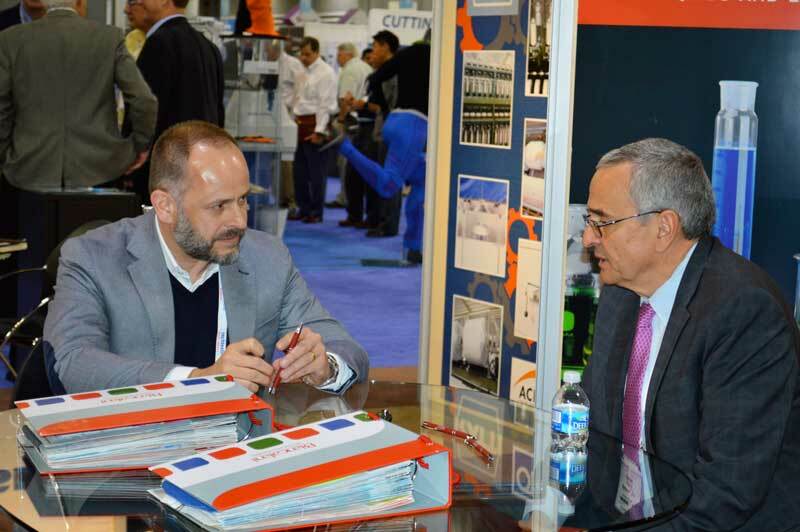 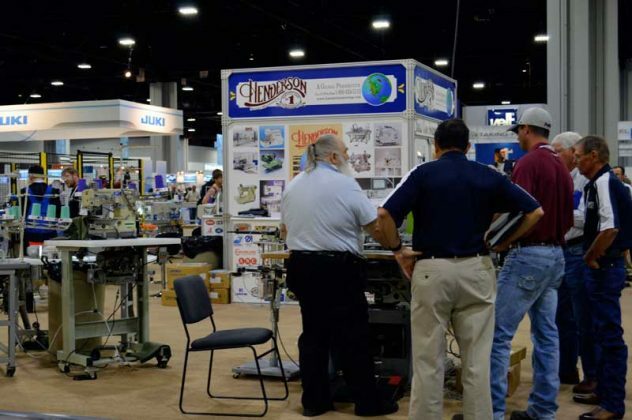 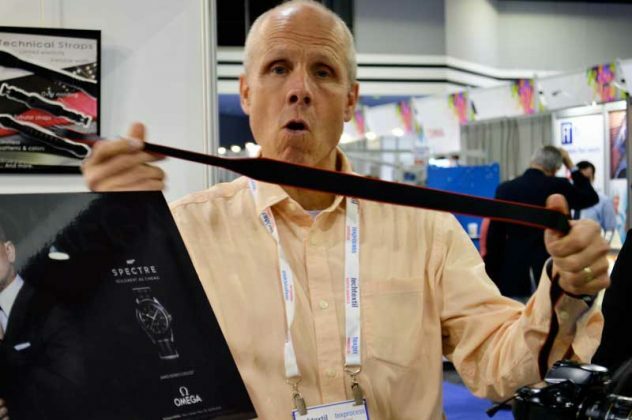 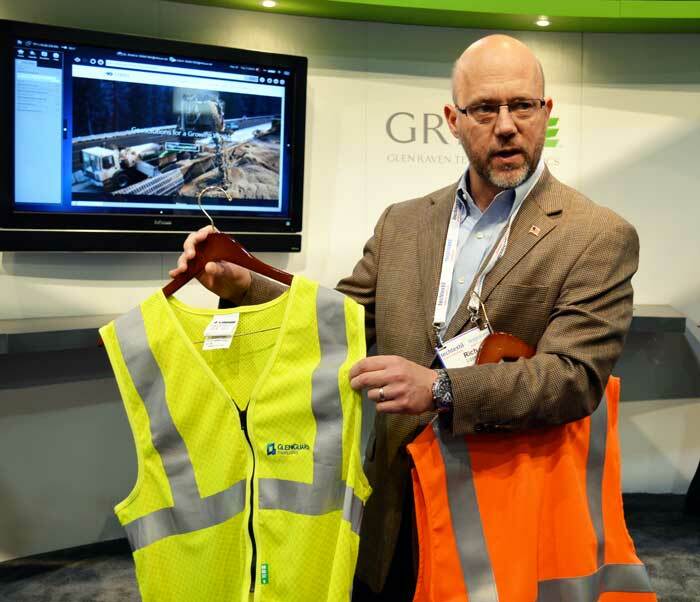 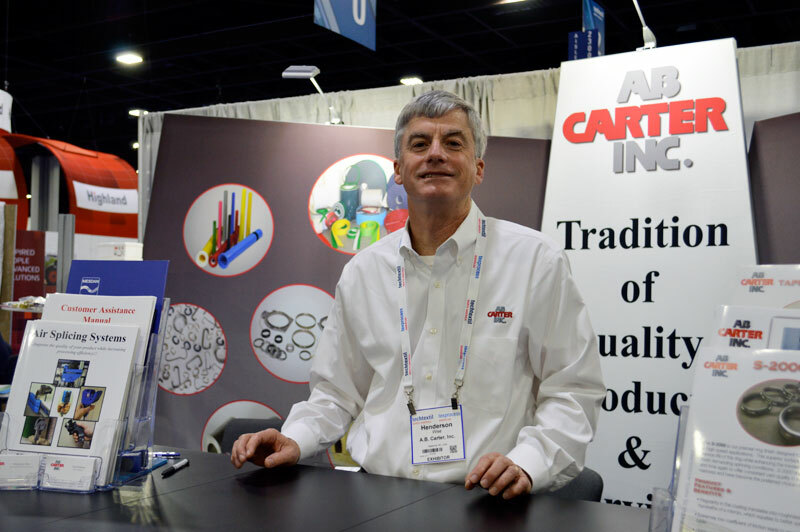 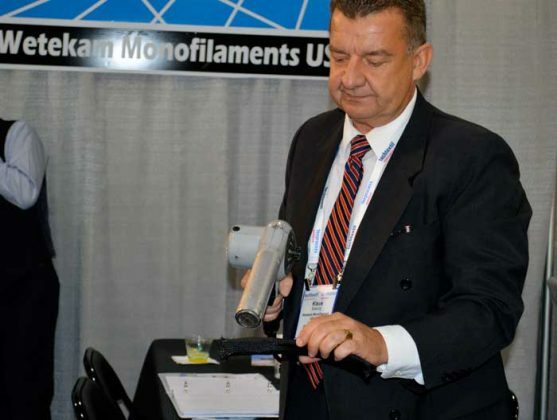 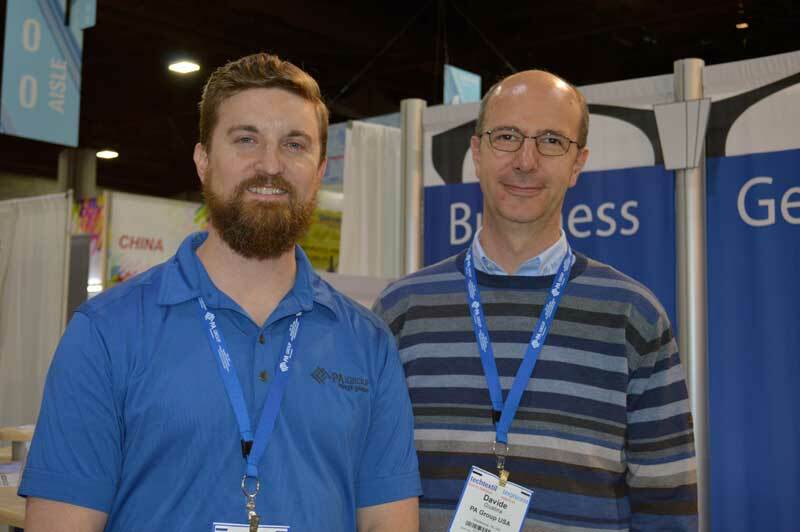 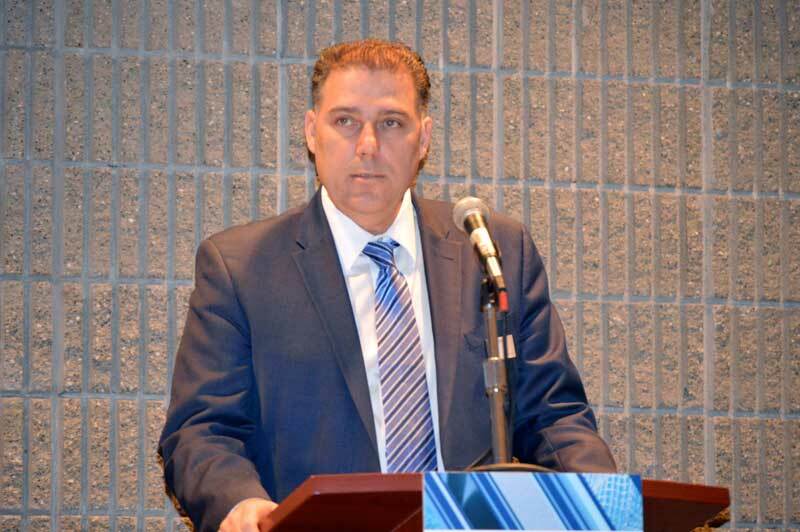 Techtextil North America, along with Texprocess Americas 2016 and JEC Americas 2016, collocated at Atlanta’s Georgia World Congress Center (GWCC) May 3-5, 2016, for a three-day event that offered something for just about everyone involved in the textile industry. 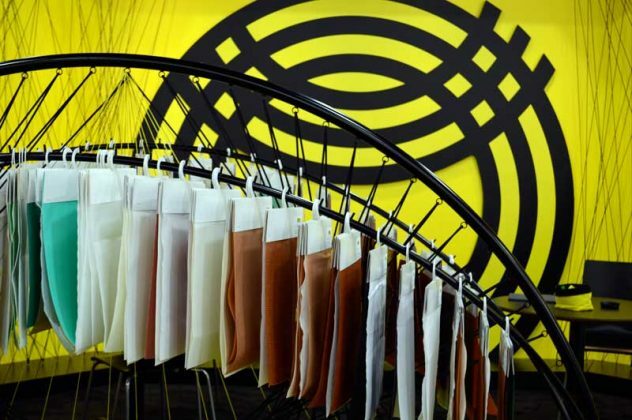 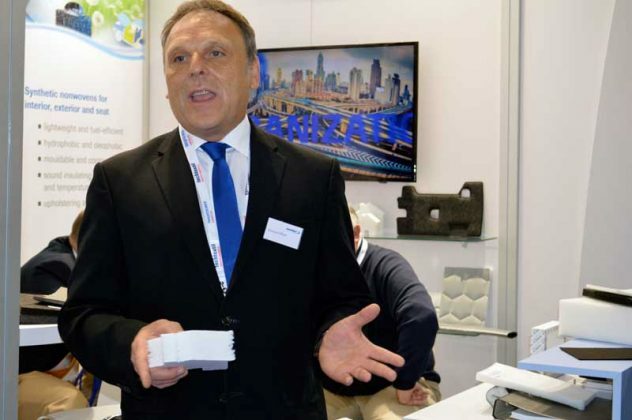 First time Techtextil North America exhibitor Germany-based Olbo & Mehler exhibited basalt fabrics for high-temperature applications among other technical fabrics. 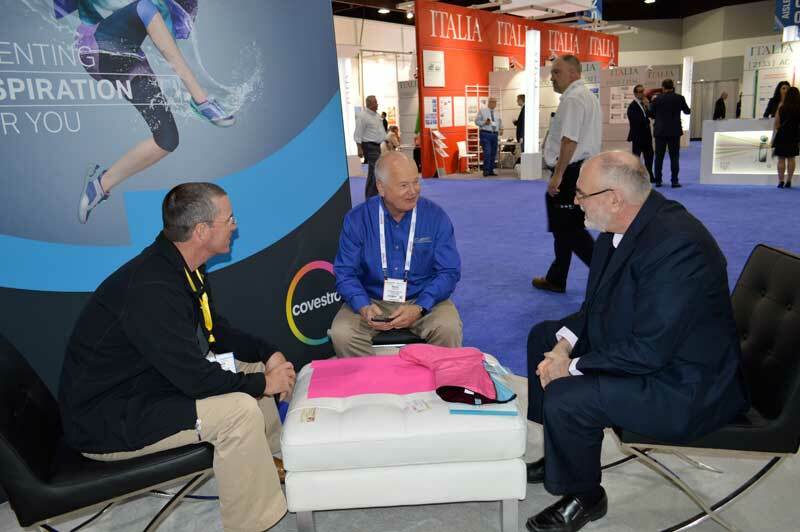 Rich Lippert, director of business development, Protective Market, Glen Raven Technical Fabrics, Glen Raven, N.C.
Frantisek Beno (left) and Petr Zapletal, Czech Republic-based glass and natural fiber nonwovens producer Kobe-cz. 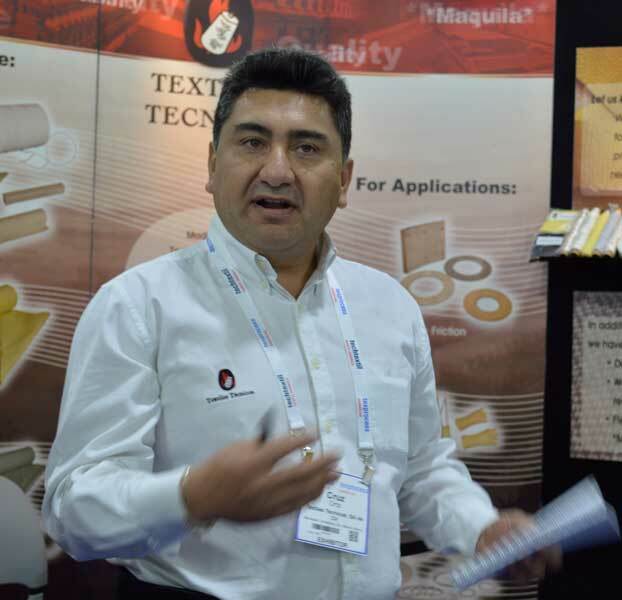 Stanley Hsu, Taiwan-based Litex Textile & Technology Co. Ltd.
Cruz Ortiz, Mexico-based technical yarn manufacturer Textiles Técnicos S.A. de C.V. 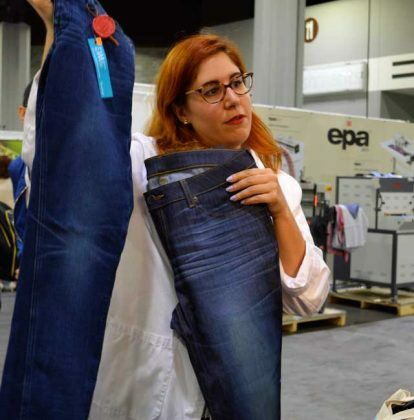 Rob Singer, France-based JTTI Group's business development office, Burlington, Vt.
Jeanologia laser-treated denim after treatment, but prior to washing. 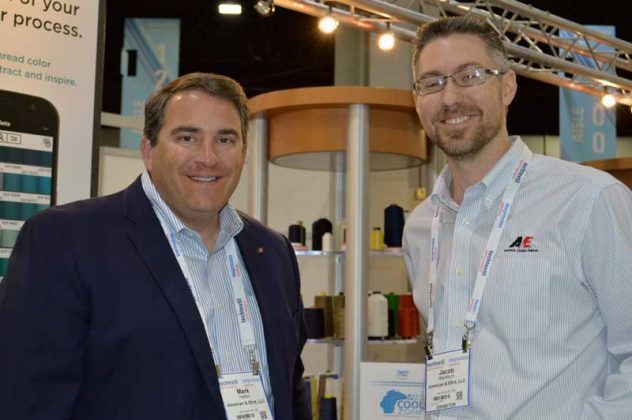 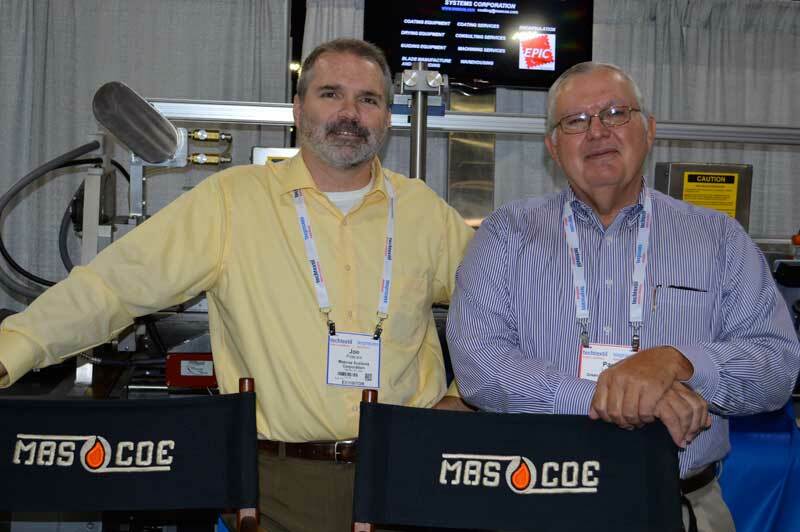 Mark Hatton (left), vice president sales - Americas; and Jacob Blackburn, global marketing coordinator, American & Efird LLC, Mount Holly, N.C.
Henderson Wise, national marketing manager, A.B. 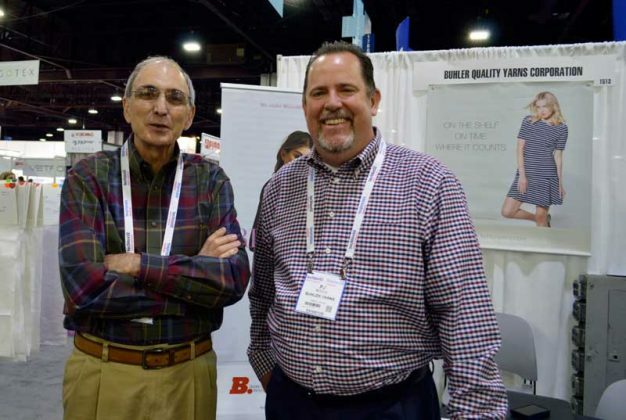 Carter Inc., Gastonia, N.C.
Victor M. Almeida (left), textile engineer, sales, customer support; and PJ McCord, director of sales, (the Americas), Buhler Quality Yarns Corp., Jefferson, Ga. 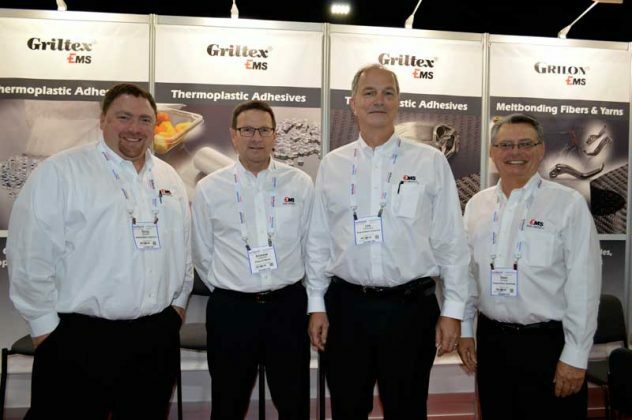 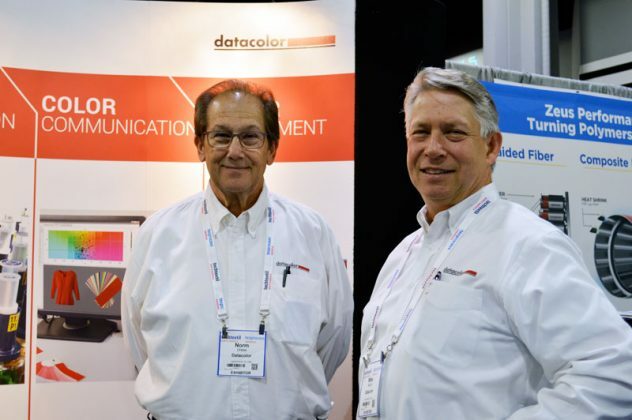 Norm Uress (left), sales representative, Advanced Color Technologies Inc., Greenville, S.C.; and Mike Tancini, director of sales, US/Canada, Datacolor Inc., Concord, N.C.
L. Dean Johnson (left), market manager, technical fibers, EMS-Chemie (North America) Inc., Sumter, S.C.
Jim Hopkins (right), director of sales and marketing, Hamrick Mills, Gaffney, S.C.
Terry Zens (left), president, Zens Manufacturing Inc., Milwaukee; and Harrell W. Ligon, president, Lang Ligon & Co. Inc., Greenville, S.C.
(left to right): Harrell W. Ligon, president; Jim Stephens, technical services; Stephen "Steve" Charron, technical services; and Brian Brimer, technical sales and service, Greenville, S.C.-based Lang Ligon & Co. Inc.; with Davide Benelli, Italy-based Ergotron S.r.l. 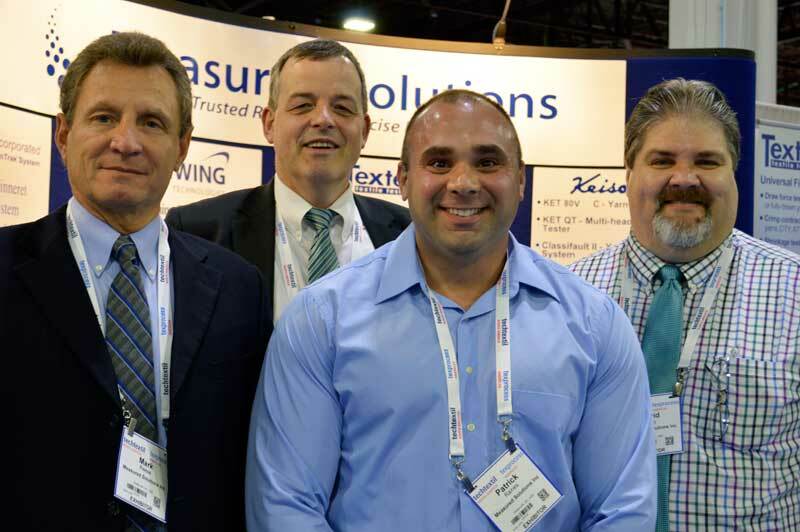 Joseph G. Poterala (left), vice president of operations, Mascoe Systems Corp., Greenville, S.C.; and Paul Ledford, president, Green Textile Machine LLC, Kings Mountain, N.C.
(left to right): Mark Reese, owner, Measured Solutions Inc., Greenville, S.C.; Thomas Schwing, managing director, Germany-based Schwing Fluid Technik GmbH; Patrick Raines, Measured Solutions; and David D. Curry, Measured Solutions Inc.
Jerry F. Simmons (left), senior sales manager, High Performance Yarn Division; and Kim Hall, sales representative, High Performance and Specialty Yarn Divisions, Pharr Yarns LLC, McAdenville, N.C.
(left to right): Jessy Lauga-Brown, regional sales manager, textiles, and sales administrator, Tinius Olsen, England; Susan Miller, sales administration, SDL Atlas, Rock Hill, S.C.; John Crocker, business development manager, SDL Atlas; and Brian M. Leavitt, sales engineer, Process Innovations, Dartmouth, Mass. 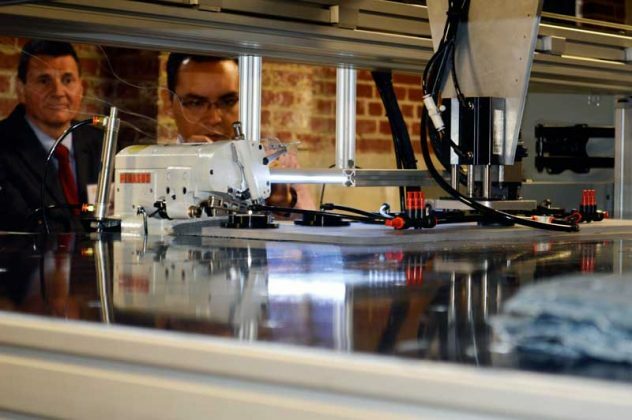 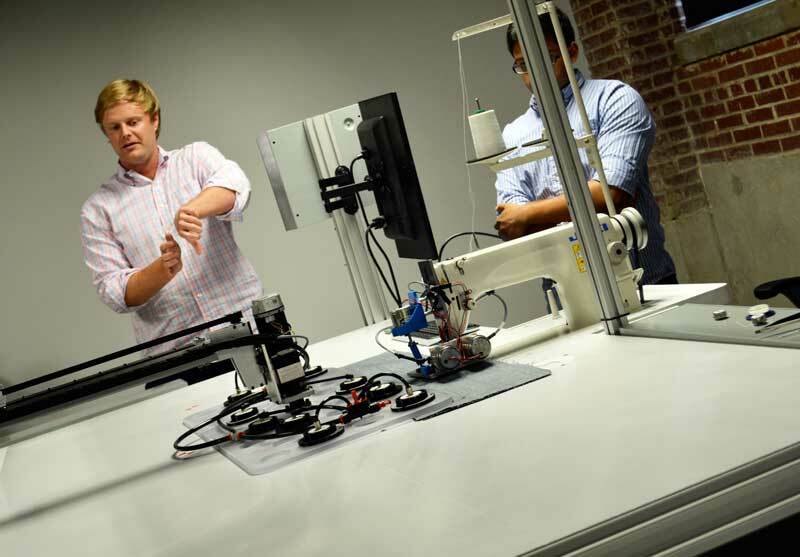 SoftWear Automation's budger technology uses camera vision systems to move fabric during the sewing process. 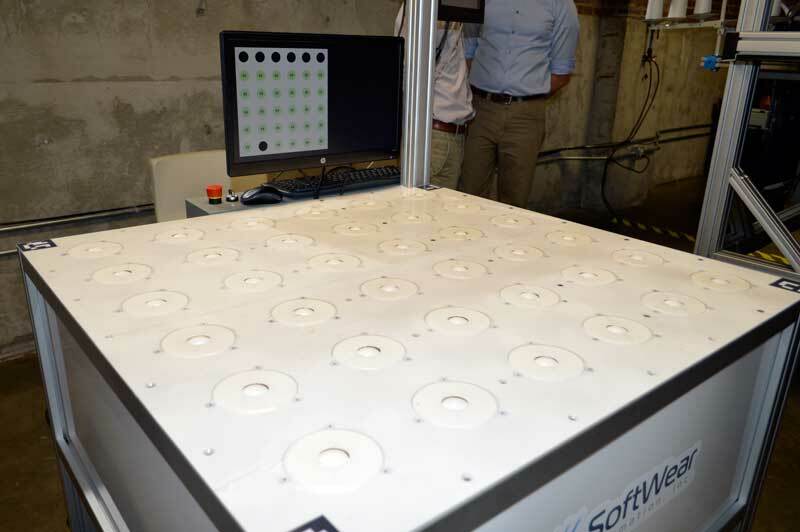 SoftWear has several technologies in developement that will be commercially available very soon including the automatic sewing machine (ASM). 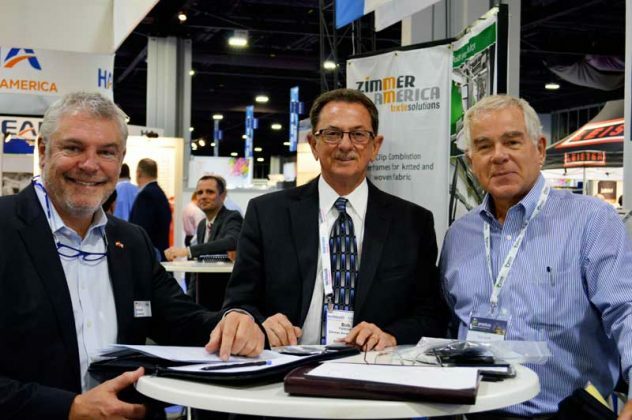 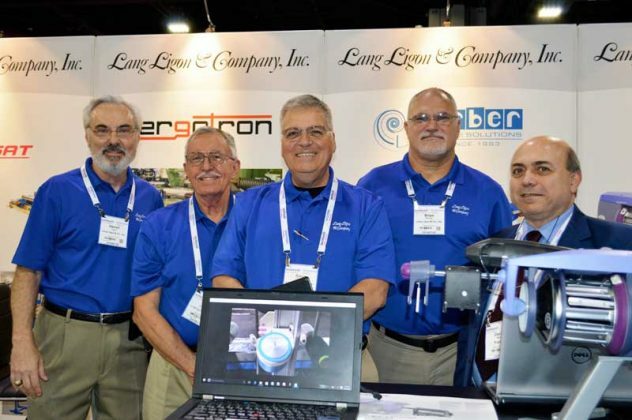 Dr. Filippo Lanaro (left), managing director,Italy-based Lawer S.p.A.; and Erwin J. Holbein, president, Symtech Inc., Spartanburg, S.C.
(left to right): Roland Zimmer, president and CEO, Zimmer America, Cowpens, S.C.; Bob Patterson, sales manager, Zimmer America; and Tony Guhr, director, Carbon Fiber Remanufacturing (CFR), Whitewater, Kan.